Bad things happen to teeth at times. Oftentimes, even the most beautiful set of teeth is prone to getting cracked or hairlined by some unfortunate accidents or slip ups. The worst that could happen is when the molar(s) detaches itself entirely from the gums, leaving no chance for the detached natural tooth to be installed again. This might leave the person discomfort in the long run, especially in swallowing hard food, since there are only limited molars to work together chewing the food. This is where dental bridges come into the story. Bridges, or fixed partial dentures are often used to replace the permanently lost and unattachable teeth (esp. molars) that are essential in performing day-by-day chewing routines. Bridges are not to be entirely confused with dentures. People using bridges usually do not have crooked teeth before the procedure, and the cause of the tooth loss is certainly caused by accidents. The also obvious difference is that bridges are used for missing teeth, while dentures are set to replace an entire row of teeth. Bridges can also be called fixed partial dentures. But how does a bridge work? Well, the false set of teeth (or the bridge) is attached to the still-intact teeth that are adjacent to the ones that have been lost. But before a bridge is installed, the dentist must carefully check if the adjacent teeth are compatible to the to-be-installed false ones. 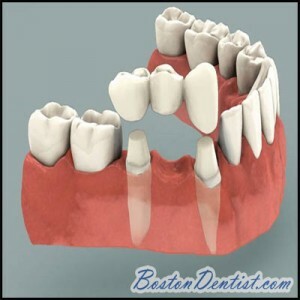 If there is a problem, the dentist may reduce the size of the adjacent teeth to accommodate for the bridge. Common materials used for bridges are: gold, porcelain and on some other cases, porcelain-fused metal. The two ends of the bridge must perfectly coincide with the abutment teeth, or else periodontal problems and swelling may occur. The materials of the bridges differ in density, so the reduction of the abutment teeth may also vary, to accommodate to the foreign material. Precision is the key to avoid any periodontal problems involved with the long term placement of the bridges. Besides dentures, bridges are often the hardest to construct, because any short-term discomfort may lead to long-term pain. Using the traditional fixed bridge, the false (or pontic teeth) is attached in between the two natural (or abutment) teeth. 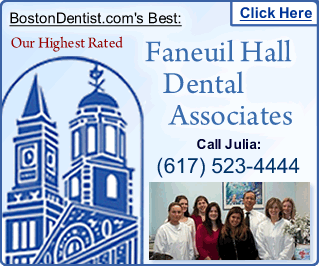 The two crowns of the false teeth are attached to the two ends of the abutment teeth. This procedure is permanent and irreversible once installed, thus requiring the more need to be precise on the measurement of the pontic teeth. The false teeth will also serve as a pillar or a reinforcement to the two natural teeth that they have been attached to. Resin-bonded bridges are the cheaper alternative to fixed bridges, but these are only offered to patients who have very healthy teeth surrounding the crater where the bridge is to be installed into. Another reason why bonded bridges are less expensive is that they can’t be used for molars (most of the time). Missing front teeth are usually the ones replaced by this type of bridge. Finally, the cantilever bridge is very also very indentical to resin-bonded bridges, for the reason that it usually is installed to cover for missing front teeth. The only difference between a resin-bonded and cantilever bridge is that the latter only needs to be attached to one side: either a left or right adjacent tooth. We strongly advice that you go to a dental bridge specialist to see what procedure will bring out the best long-term benefits to your teeth.